No drinks on the table! My students are really tired of hearing me say that at the beginning of each workshop. Now they tell new students that Nemo insists that no drinks can be on the table before I notice the offending bottles, cans, mugs, and cups. 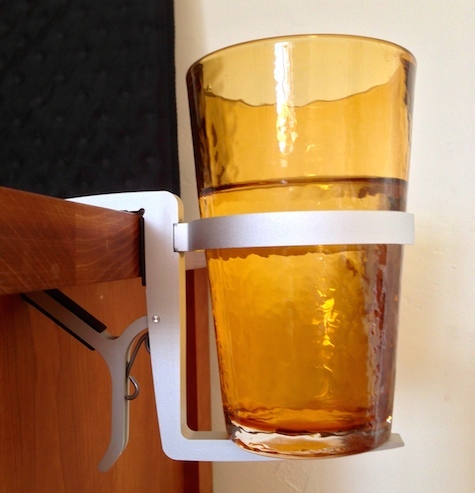 If $50 is a lot of money to spend on the Vector Anodized Aluminum Collapsible Cup Holder, then consider the swap of convenience and safety for the potential ruin of your iPad, iPhone, Macintosh, iPod, camera, and all other gear within spilling range of your beverage. 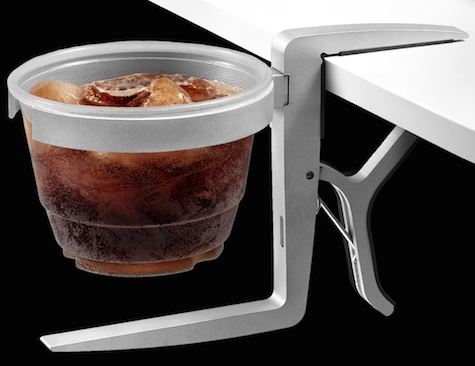 Vector’s snug and padded clamp opens wide to grab securely all but the thickest desks, counters, and tables. My teaching season begins in two weeks. Vector is coming along to every class to be used with my water bottle. No exceptions. I wish I could buy several dozen Vectors at wholesale and give them to my most loyal seminar participants. This clever product is recommended, with a MyMac Review Rating of 8 out of 10. The score would be higher if the price was lower and if the adhesive on the clamp arms’ padding didn’t fail in my cozy Arizona studio while I was on vacation and the temperatures were hot and hotter. Hey! Get your mug off the table top, pronto. I prefer non-Bluetooth mice with either a USB-transceiver or a conventional cable. Rapoo’s extremely affordable 3000P Wireless Optical Mouse’s USB insert plugs neatly into the mouse’s bottom when not in use. With the insert in place in a Macintosh plus two AA batteries (not included) added, this versatile, compact mouse is one of the best in its category. 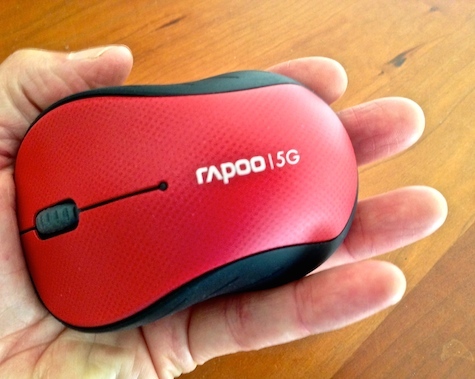 The Rapoo 3000P is symmetrical and works equally well using either hand. The right and left clickers have a friendly tap-snap sound and feel. The gray scroll wheel works perfectly. Optical tracking is quick and precise. The physical mouse will fit all male and female hands except for people with palms and fingers larger than an iPad mini. Battery consumption is very efficient. I have used this evaluation product for all mousing with my MacBook Pro for several months, and I give it my highest recommendation. Our MyMac Review Rating is 9 out of 10 and would be a perfect score if a pair of quality AA batteries was included in the package. How many geebees does it have?